What is the healthiest and best dog food for Great Danes and Great Dane puppies? Wondering how it’s possible to give your Great Dane the most awesome dog food or puppy food for the happiest and healthiest possible life? Or maybe you’ve just ‘bought that doggy in the window’ and got yourself a new Great Dane puppy? Either way, congratulations on owning one of the most beautiful giant-breeds in the whole world. Picking out the best dog food for Great Danes is super, duper critical from Day One, and what’s suitable for your Great Dane on Day One won’t be the same as what’s best for her as she grows bigger and, well, Greater! What should be inside the best dog food for Great Danes? …but every one of the best Great Dane foods must have protein and fat! V for Vegetables, V for Vitamins! What distinguishes the top puppy food for Great Danes? How much (or little) Great Dane puppy food does my puppy require? Does the best Great Dane food help to prevent common health conditions? Can I leave my Great Dane puppy more puppy food to make her grow faster? Did you know that caloric content isn’t actually required by law when it comes to dog food? In actual fact, as a Great Dane Mum or Dad, you’ll often be required to search online for this information to ensure that you’re not unintentionally feeding too many daily calories to your Great Dane puppy or to your Great Dane adult. But how much is too much, and how little is not enough? Life stage– the best dog food for our Great Dane puppies is going to have higher caloric content, giving them the necessary energy for growth and for developing their long, elegant, and strong bones. For adults, the best Great Dane food will have a calorie content that allows you to aim for between 2500-3500 kCal at least, daily. Activity level– whether your Great Dane is active or more sedentary will determine whether she will require a higher or lower calorie intake. The best Great Dane food for both active and less active adults will be around 375-450 kCal a cup, and it’s up to you to give them more or fewer cups depending on how much they exercise. The best puppy food for Great Danes will have a slightly lower calorie profile of between 350 and 400 kilocalories in each cup, but also be higher in protein and fat. We cover how many cups daily of Great Dane puppy food are recommended a little further on in this article. General height, weight, and size– The best Great Dane food will allow you to feed greater or lesser amounts to your adult and mature Great Dane depending on her physique when she is fully grown. Larger adults, usually males, will require a larger amount of daily calories than smaller adults or females. And your doggies are relying on you to make very sure their protein and fat is coming from reliable, healthy, and ideally responsibly sourced ingredients. For both of these two essential macronutrients, the first things to ask yourself when looking at different dog food or puppy food labels are as follows: Is the ingredient listed at number one a real meat? And also: Am I able to tell what precise kind of animal fat is used in this dog food? Real animal meats for protein and real animal fats are both exactly what they sound like! The best Great Dane food or puppy food will list something like beef, lamb, venison or chicken as the top ingredient, so you know that you’re looking at a high-quality dog food or puppy food for Great Danes. If you see something that makes you a little confused- like by-product meal for protein, or lard rather than pork fat for fat, then it’s probably not a great dog food, sorry! 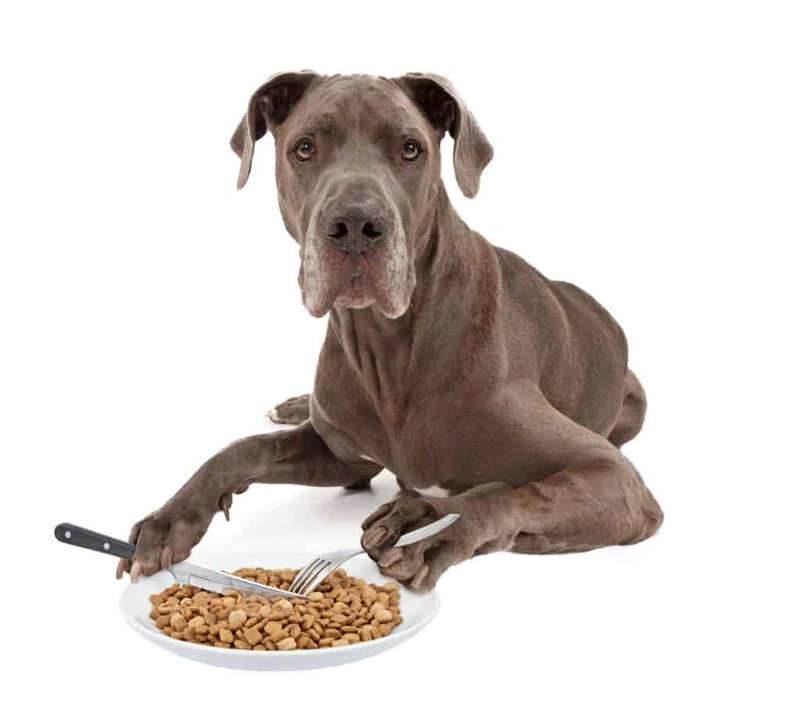 Next up, we look for conventional ‘filler’ ingredients, which can be anything from soy flour to ingredients including corn gluten meal, and typically only play a role in structuring kibble and giving your Great Dane’s dog food or her puppy food a longer life on the shelf. Great Danes can be quite sensitive to gluten and wheat products in their dog food or their puppy food, so it’s often not a bad idea to ensure that you are choosing something which has either a very low level of these or is entirely free from grains. The best Great Dane food should be yummy, healthy, and store well without having to use artificial add-ins. Usually, the best Great Dane food or dog food for giant breeds will advertise this fact on their dog food labels, as it is, after all, something worth noting. 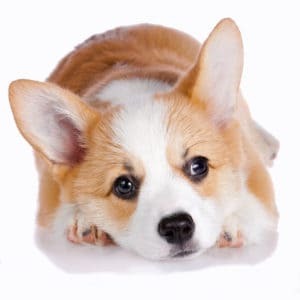 When you can see that a dog food label mentions “tocopherols”, it means that a certain ingredient has been preserved naturally using Vitamin E. Also in this vein, “ascorbates” refer to Vitamin C derived preservatives that are again, natural. If you’ve got kids, rest assured that getting healthy veggies into your Great Dane is a much simpler task! The best dog food for Great Danes- adults and puppies alike- will often have the wholesome goodness of real veggies inside. From Vitamin K and C in spinach, to A in carrots and D in E in tomato, you’ll be doing your Great Dane a much-appreciated favor by checking the label for these ingredients. 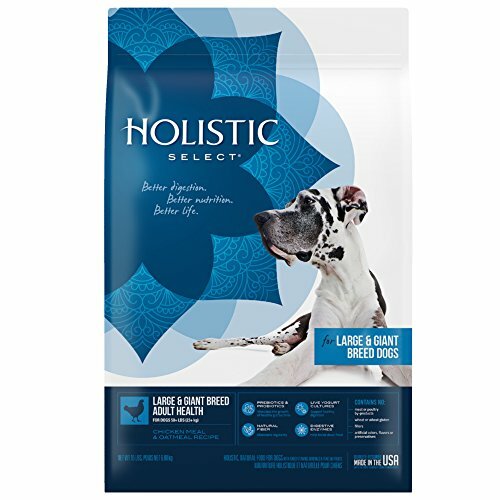 We just love any Great Dane dog food that packs in veggies, and the nutrient mix in Holistic Select is absolutely fantastic. We don’t hesitate to recommend it! 14% fat, sourced predominantly from naturally preserved chicken, too! Calcium is at the 1.3% mark, which we very much like! Besides the awesome nutrient profile, it’s got glucosamine and also chondroitin that work as a pair to help prevent hip dysplasia in giant-sized dogs! Made to include blueberries and pumpkin, apples, and a whole other bunch of fantastic veggie and fruit! Contains L-Carnitine, which is an amino acid transporter of fatty acids within dogs- a good thing! Actually, none really that we were able to spot! 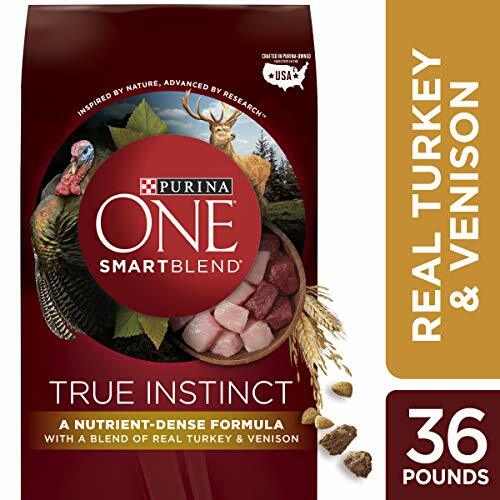 Despite its relatively high composition of gluten products such as wheat and soy, Purina ONE delivers an excellent source of real, identifiable protein and a healthy amount of naturally derived (and preserved) fat. So YES, we consider Purina ONE to be a candidate amongst the very best food for Great Danes! #1 and #2 ingredients are real de-boned turkey and lovely real venison! Maybe you guys knew better, but we all thought Ms. Ray was only famous for human food! 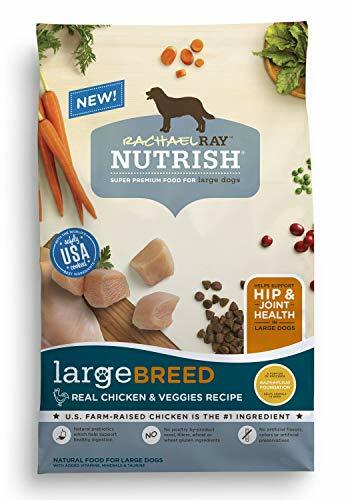 This is a healthy option that’s based primarily on real vegetables and meat- two things we always like to see when we’re looking for the best Great Dane food and dog food that’s suitable for giant dogs. Some of the profits from this Great Dane food go towards treatments and medical supplies for pet charities, isn’t that awesome? We reckon! No flavors or preservatives that aren’t completely natural! As with all the other dogs that are giants, Great Dane puppies will tend to take a slightly longer while to reach their final adult size. It means that you’ll typically be giving puppy food to your Great Dane until they’re around the age of 12 months, compared to a shorter period for toy or smaller breeds. During this period your Great Dane puppy is going to require more of the building blocks that are essential for growth, and by building blocks we mean- you guessed it- protein! A higher protein content within the best Great Dane puppy food will, therefore, be the number one thing to look out for, followed by higher percentage fat levels. Fat is burned as calories, and my goodness do Great Danes need energy to grow. It’s not overly surprising given that they tend to be born at around 2 lb in mass, and reach up to 200 lb after a year! If you’re looking for a recommended ballpark figure when it comes to fat content, try to pick a Great Dane puppy food which has at least 12-14%, but as we noted, Great Dane puppies will be in need of something towards the higher end of this scale. As is the case with the best food for Great Danes who are fully grown up, the best food for Great Dane puppies will source its fat content from ingredients that you can easily put a name to. DHA and it’s fellow unsaturated fatty acid EPA are two things that you absolutely need to search for in the best puppy food for Great Danes. Without these two nutrients, you’ll be depriving your Great Dane puppy of the best chance to develop healthy joints and brain. It is recommended by vet research journals that EPA should be present at around the 1.75g level per kilo of Great Dane puppy food, and DHA at close to 2.2g per kilo. At this point, most Danes can be carefully and gradually switched over to Great Dane food for adults. Also try to remember that Great Dane puppies do need to eat at around 3 mealtimes daily compared to adults, who are generally fine with just 2 daily meals. 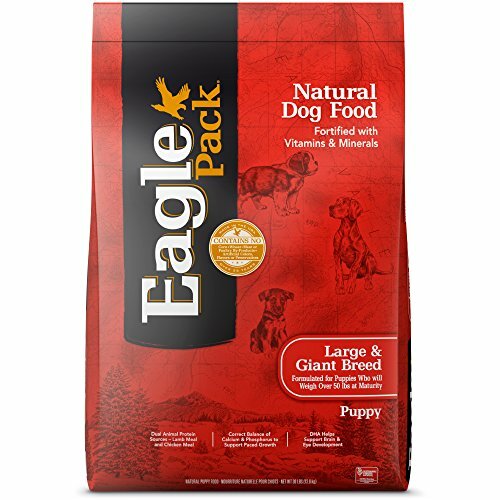 This isn’t specifically designed for Great Danes, but it’s still one of the best puppy foods for Great Danes simply by being crafted for giant-breed dogs in general. On the plus side, this means that with careful planning and attention, you can also feed this to your Great Dane adult if she is pregnant or nursing. As we’ve noted before, calcium and the correct fatty acids play a pivotal role in giving your young Great Dane puppy the best start to a long and healthy life. 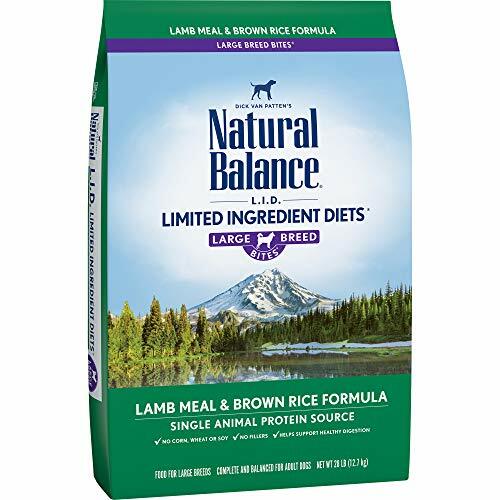 Natural Balance creates this in its puppy food alongside a lovely dose of Vitamins whilst keeping its puppy food completely free of artificial add-ins. Top and primary ingredient…is lamb meal! We always love to see real meat in first place! 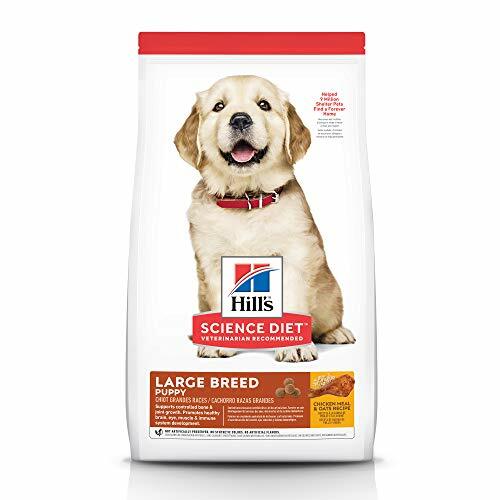 We’re always confident about nutrition when we buy Hill’s Science puppy food because it’s guaranteed to exceed AAFCO requirements around dog food. While we believe the best dog food you can feed a Great Dane puppy is made without fillers such as corn gluten and wheat, we feel that it’s hard to come across an economical Great Dane puppy food with such an excellent healthy profile. Real chicken is the main protein source, with total protein at a whopping 30%! Made including our favorite veggies, such as broccoli, carrots, green peas and apples. Vitamins, here we come! It’s a sad fact that Hip dysplasia (CHD) tends to be a common condition for giant-breed dogs, and involves a possibility that your Great Dane may later develop arthritis and potentially joint degeneration. The very best Great Dane food should contain added glucosamine along with its partner nutrient chondroitin that act together to heal and relieve the symptoms of CHD and osteoarthritis. At the same time, they help in synthesizing new cartilage, which is basically what is damaged when your Great Dane has CHD. 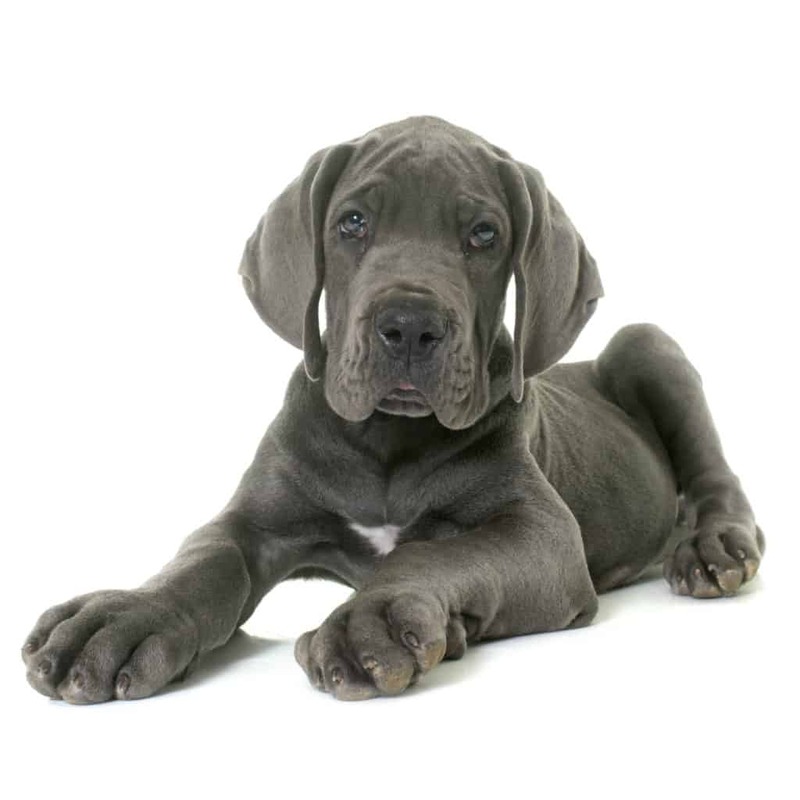 It’s essential for Great Dane puppies to obtain chondroitin and glucosamine from their kibble or puppy food, as CHD can begin at an early age. Plus, we all know that prevention beats cure every time! What this means for you-the Great Dane puppy food purchaser- is that you should make it a point to select the best food for Great Dane puppies specifically by ensuring that you keep CHD and these two important nutrients in mind.